Newfoundland Blueberry Jam with lime, made with low sugar pectin. Newfoundland Blueberry Jam with lime, using low sugar pectin. Newfoundland Blueberry Jam with lime, using low sugar pectin. Made with incredible Newfoundland wild blueberries. The hint of lime pairs beautifully with the berries and the low sugar recipe lets their natural flavour shine. I’ve long said that Newfoundland Blueberry Jam is the best in the world. There is something about the cooler climate here that imparts an intensity of flavour into the berries that I have never tasted anywhere else. Our naturally occurring wild blueberries are the low bush kind, perhaps made even shorter by the whistling winds common across Newfoundland barrens. They are smaller and sweeter than high bush berries. My grandmother would say that a touch of frost made them even sweeter. Growing up, we always picked blueberries for the freezer in late August and early September. Everyone seemed to have their favourite, and sometimes secret spots, for picking. We didn’t need secret spots because the uncultivated lands around our childhood home bore plenty of fruit every year. My father is in his late 70’s and is still a prolific picker of berries and ultimately my source for blueberries throughout the year. I’m not afraid to raid his freezer if my supplies run low. 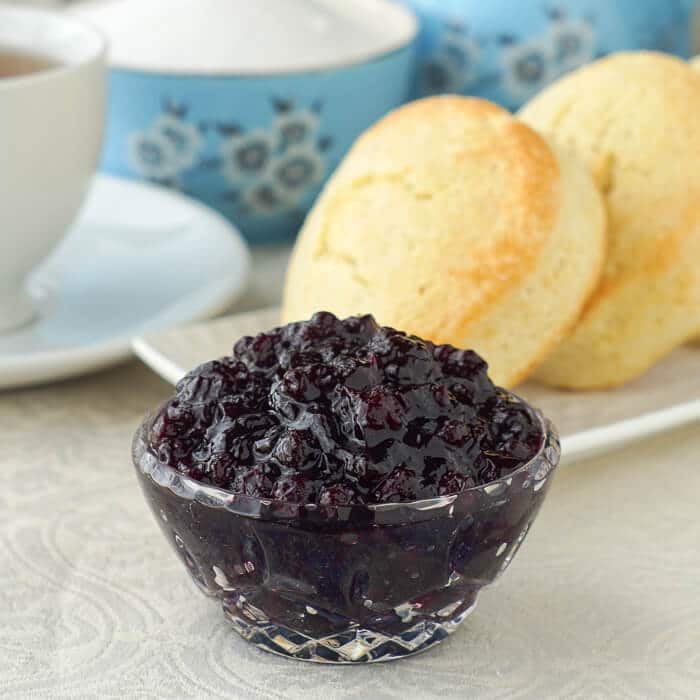 While we always made jam from blueberries, it was often far too runny, as we never added any pectin to it. Slices of fresh homemade bread with a layer of Fussels cream and runny blueberry jam tumbling off the sides is still one of the best things I’ve ever tasted. It is absolutely sublime. I would trade the best pastries in the world for a slice of that bread I enjoyed as a kid. I was recently encouraged by my Facebook friend Martha, a very able maker of all things canned (or we we would say bottled), to try the Bernardin brand of low sugar pectin. I had been bemoaning the fact that regular pectin took so much sugar to set and that I hadn’t had great success with other brands of lower sugar pectin. When a woman of Martha’s expertise talks, I listen and boy am I glad I did! The jam held up beautifully with probably 1/4 of the sugar that I would have had to use in a regular pectin jam. It didn’t have the jelly-like consistency of normal pectin jam but was spoonable and not runny at all. 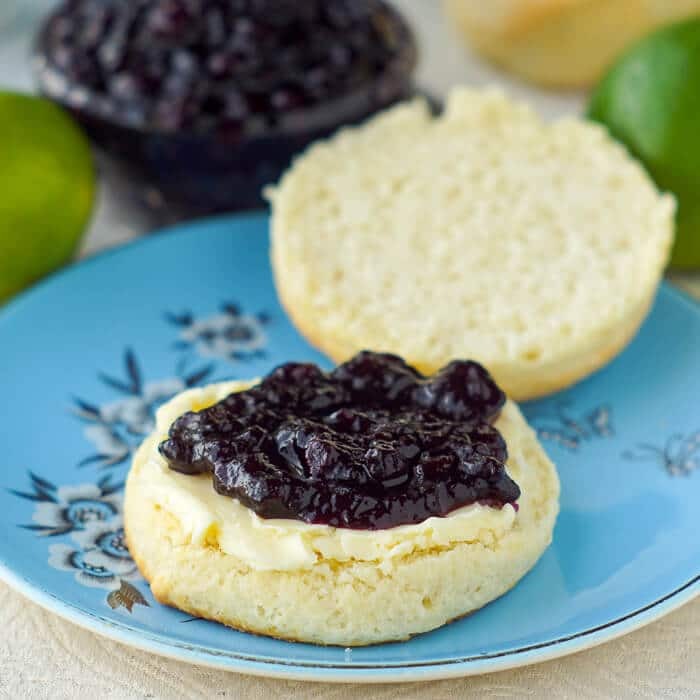 I’ve always added lemon juice to blueberry jam but when I recently heard of lime as an addition instead, I used lime juice and a little of the zest in my jam and it was utterly delicious, while letting the full flavour of those amazing Newfoundland wild blueberries to shine through. I think this will be a go-to blueberry jam recipe in our house from now on. 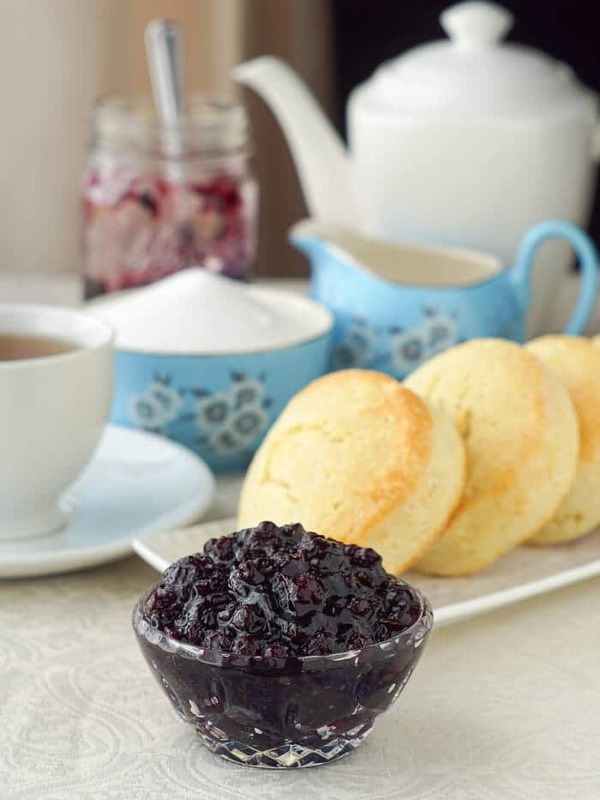 Like this Newfoundland Blueberry Jam recipe? 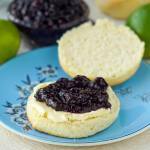 Newfoundland Blueberry Jam with lime - made with incredible Newfoundland wild blueberries. 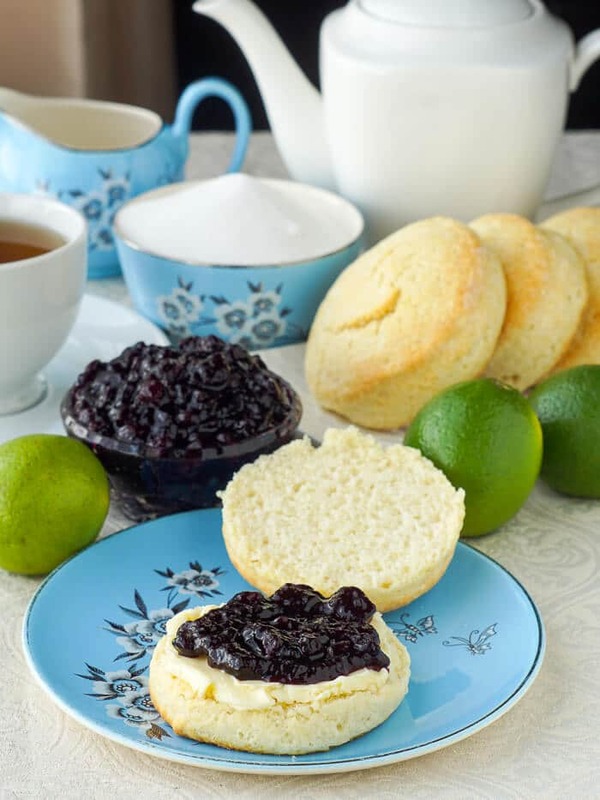 The hint of lime pairs beautifully with the berries and the low sugar recipe lets their natural flavour shine. Zest 2 of the limes and finely chop it..Squeeze all of the juice from the 3 limes. Crush the blueberries well. I use potato masher on mine. Add the berries to a medium sized saucepan along with the pectin, lime juice and apple juice. (NOT THE SUGAR OR LIME ZEST YET). Bring this mixture to a rolling boil over high heat, stirring constantly, for 3 to 4 minutes. Add the sugar and lime zest and boil hard for another 3 minutes, stirring constantly. Remove from heat and bottle according to the jars manufacturers instructions, including processing in a water bath. You'll find a link to the Bernardin Guide in the recipe notes. 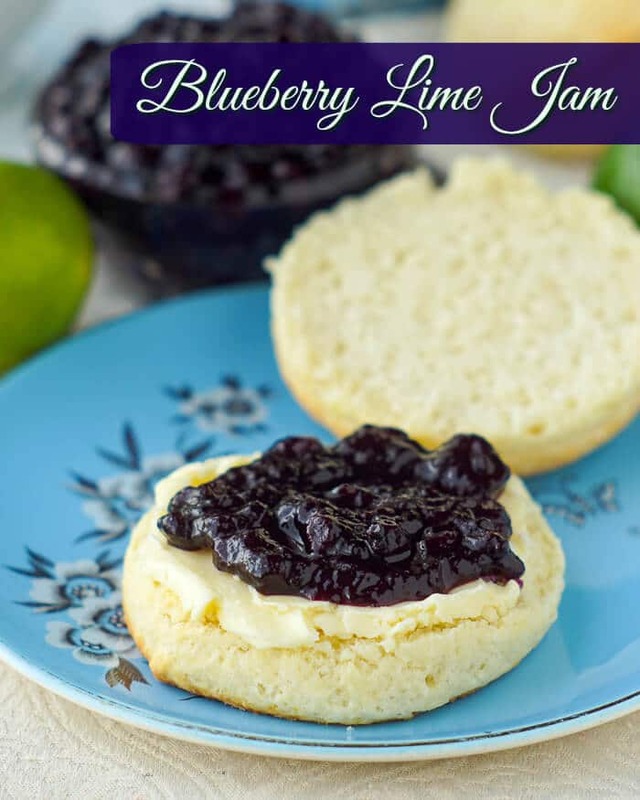 If you prefer not to add the lime flavour, this jam is easily made without it. Just use lemon juice instead and leave out the zest altogether. When do you add the pectin? I couldn’t find it in the recipe and I would love to make this. Ouch! At the beginning with the berries. Thanks for the quick catc. I’ll fix that. Is it the liquid or the crystal pectin? I’ve only ever seen the low sugar pectin as crystals. Do you think the same recipe would work for raspberries?